When standup comedian Nathan Brannon moved into his newly purchased home in rural Washington state, it seemed the joke was on him: The previous owner had left the pegboard on the garage wall, but had taken all the pegs. Brannon isn't the only home buyer to discover that sellers sometimes take the strangest things with them when they vacate a property. We've seen home buyers ranting on social media about missing doorknobs, toilet paper holders, and even trees from the front yard. But it can be far beyond merely annoying for the buyer. If you take something you haven't negotiated to keep, you could tank the sale—or even face a lawsuit. Not sure what you're allowed to take with you when you move? Here are some rules to keep in mind before—and after—closing the deal. When Laurel-Ann Dooley walked through a vacation property she was purchasing, there was a glaring hole where a storage shed had recently stood. “The previous owner had sold it, even though it was supposed to stay,” recalls Dooley, who's an attorney and Realtor® at PalmerHouse Properties in Atlanta. While most buyers and sellers probably know that "fixtures"—immovable elements of a home such as built-in furniture, fences, or, yes, a storage shed—must stay behind, there can still be some confusion, says Bill Gassett, a Realtor® with Re/Max Executive Realty in Hopkinton, MA. “Probably the No. 1 gray area that I've found is the mounting mechanism for big-screen TVs,” Gassett shares. “Obviously, it’s attached, so it’s supposed to stay with the house. But commonsense says, ‘Well, if somebody has a $3,000 TV hanging on the wall, unless they’re including [the TV] with the house, [the mounting mechanism] doesn’t stay.’"
"It becomes a real battling point with buyers and sellers if it’s not specifically referenced,” he adds. Generally, Dooley says, if a house has been modified for an item, it’s probably a fixture. With that said, you want to avoid "arguably", "probably", or "most likely" when it comes to selling your home, Dooley cautions. Be specific and firm. “If you want it, say so upfront,” Dooley advises. 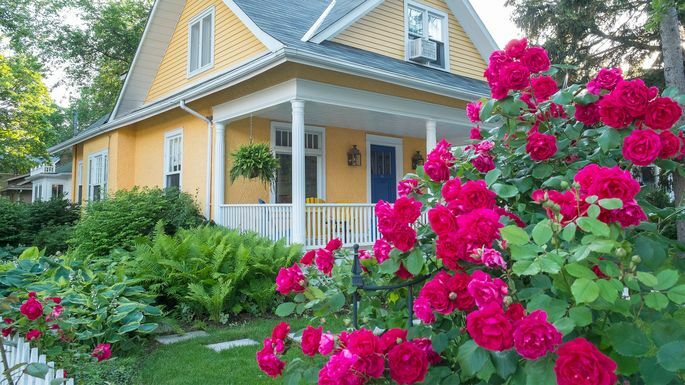 Unless the property listing specifically mentions that you intend to take the prized rose patch your Aunt Zelda gave you, sellers cannot remove any landscaping, Gassett says. Other backyard items are also potential sources of misunderstanding between buyers and sellers. “Technically, if a basketball hoop is cemented into the ground, then it’s considered to go with the house. Freestanding ones sitting on the lawn, however, would be something buyers could take with them,” he says. Ditto for swing sets: If it’s anchored in the ground, it stays. Even if you’re attached to your show-stopping dining room chandelier, don’t pack it up and leave electrical wires hanging when you leave. And if you're thinking about swapping out that chandelier right before closing—and hoping the buyer won’t notice? Forget about it, Gassett says. “When you buy a property, you’re buying what you saw the day you saw the property and wrote the offer on the house, so for sellers to change something out after that date is illegal,” Gassett warns. Yes—illegal. You can declare your intention to remove it, Dooley says, but be aware that excluded items often become sticking points between buyers and sellers. “Instead, take that chandelier out before you list your house, and put something else there,” she suggests. You may have spent a fortune on those custom blinds in your living room, but technically, you’re supposed to leave ‘em hanging, Gassett says. Mirrors are another murky area, he adds, but pretty easy to figure out: If they’re hung like paintings on a wall, they’re personal property. Bolted to the studs? They’re fixtures. Often, the littlest things cause the most heated debates, or even the derailment of the sale itself. Sometimes, as in Brannon’s case of the missing pegs, sellers remove things from the house that aren’t worth chasing after, but are incredibly annoying nonetheless, Gassett says. For instance, he recalls a seller who took the control box for an underground dog fence. Dooley heard of a seller who removed all the lightbulbs in the house before moving.